Newton had his apple, and Harry Traver had his seagulls. Legend has it that a diphtheria-stricken Traver was lying on a cattle boat to Europe, staring up at the sky, when he saw seagulls circling overhead. This immediately inspired Traver to create a ride that simulated their flight. Or did it? Traver himself claimed this was the story behind his now-famous Circle Swing. It's likely that his inspiration had a little help, however. Traver surely heard about or perhaps even saw Charles Braaf's early version of a circle swing while working as a mechanical engineering trainee at the 1898 Trans-Mississippi World's Fair in Omaha, Nebraska. Braaf had teamed up with a carousel maker in 1894 to manufacture a circle swing, but the carousel maker didn't get that the point of the ride was to rotate quickly so the individual pods would swing out. No one found the slow ride exciting, so Traver was able to capture the market eight years later with an exciting, fast ride. Either way, Traver filed for a patent on his Circle Swing in October of 1902. Within just a couple of years, he had installed dozens around the country. Luna Park ordered one of the incredibly popular rides in time for the start of the 1904 season and positioned it prominently in its northwest corner near the Chutes, as shown on the Historical Map in 1905. Dreamland had several types of "airships" rides as well, though not clearly Traver-branded like Luna Park's ride. At the right is a ticket for Traver's Circle Swing. By calling it a "flying machine," Traver built on the excitement for the Wright brothers' flight in December 1903. At the time, anything that flew was commonly referred to as a "flying machine" or "airship" because there were a myriad of outlandish designs for airplanes and helicopters. The term airplane had not yet become standard. The success of the Circle Swing gave Traver the money and confidence to go on to design the most infamous roller coasters of all time. 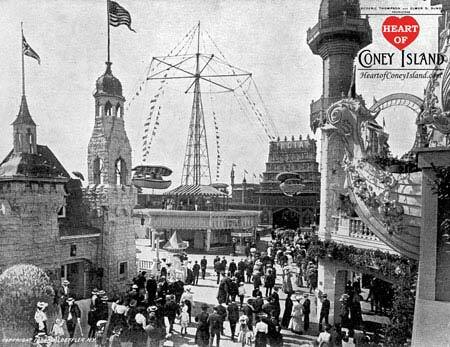 Built c. 1926 at the same time as Coney Island's Cyclone, Traver's "Terrible Trio" consisted of the Cyclone at Crystal Beach, the Lightning at Revere Beach and the Cyclone at Palisades Park. None of them had a foot of straight track except the lift ramp. If you haven't yet seen a picture of these monsters, definitely have a search online. They make the Loop the Loop look like a cakewalk.